With Unlimited Access To Nationwide Verified Vacant Houses, You Can Do More Deals & Cash More Checks Fast! Introducing The Vacant House Data Feed, your premiere nationwide Vacant House lead source. 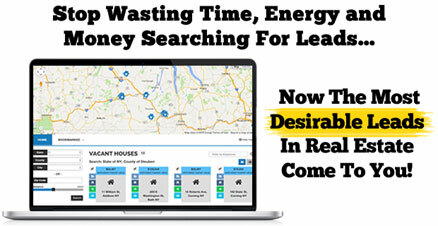 The Vacant House Data Feed gives you immediate access to high quality real estate leads from across the country. Now You Can Have The Absolute Best Possible Leads Available In Real Estate Handed To You On a Silver Platter! With access to the Vacant House Data Feed you’ll no longer have to drive from neighborhood to neighborhood searching for vacant homes - saving you time, energy, money and frustration! We’ve Gone The Extra Mile To Ensure You’ll Have An Instant Competitive Advantage In Your Market. The first thing we provide you with is the NCOA, National Change of Address, addresses for property leads when they’re available. So you’ll have the most up-to-date contact information for your best leads. You’ll also get access to homeowner phone numbers when available, which means it’s that much easier to track down the vacant home owner and get your next deal done! Lastly, we’re able to designate “Matching” vs. “Non-Matching” Address for you so that you can focus in on the best and highest paying leads. Inside the system you’ll get access to both types of leads; however when a property lead has a matching site and mailing address, we’ll highlight that for you. Matching addresses is a key “high profit deal” indicator because if the homeowner has failed to update the tax assessor that they’re leaving it’s likely the result of some type of emergency and in most cases that means they’re going to be extremely motivated. © All rights reserved. Specialty Communications Inc.